The Cristoforo Colombo Hotel is a new complex composed by three buildings, furnished with marbles and stuccoes. 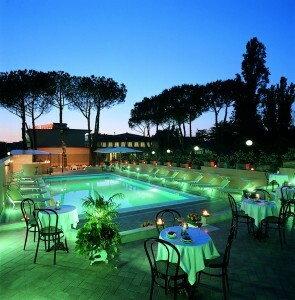 The Hotel is located just in the economic heart of Rome, few kilometres from the Roman Ring Road* is then able to meet business and leisure guests needs. The Hotel has 205 rooms, recently refurbished, each one studied to maximize guest comfort, make him feel at home. Furniture is made by natural and exotic essences, matched by colourful carpets. Each room offers the best comfort, being equipped with Satellite TV, mini-bar, hairdryer, air-conditioning, direct access telephone. During summer months is available a pool with sunshades, chairs and a refreshment kiosk. A parking place is available for guests.